Guatemala - A new IOM study shows that 97.1 percent of people who send remittances to Guatemala live in the United States of America, followed by Canada (0.8 percent) and Mexico (0.7 percent). The survey was conducted among over 3,000 families in 170 Guatemalan municipalities. The Survey on International Migration of Guatemalans and Remittances 2016 also indicates that remittances allow recipient families to afford the basic food basket and to remain slightly above the poverty line. Additionally, transfers enable them to access health and education services, and new technologies. Most of the remittances recipients live in the departments of Guatemala, Huehuetenango, San Marcos, and Quetzaltenango. IOM conducted this study in August 2016 to develop a profile of migrants abroad, the characteristics of returnees, and the volume, destination and investments made with remittances. In 2016, the annual remittances to Guatemala reached USD 7.27 billion, 99 percent as money transfers, and 1 percent in kind, according to the research. The frequency of transfers ranged from 58.1 percent who received them monthly, 9.1 percent annually, 7.3 percent every two to four months; 6 percent every quarter, and 5.3 percent every six months. Some 3.4 percent of the recipient families usually received more than 13 transfers a year, and the remaining 4.5 percent got their transfers at non-regular intervals. IOM surveyed both remittance recipient families and returnees. The report found that the leading reasons why returnees migrated were economic (64.1 percent), family reunification (9.1 percent), violence (3.3 percent), and because of sexual diversity discrimination. The main causes why surveyed people would migrate during the next 12 months were to seek for employment (31 percent) or economic reasons (24.2 percent). Other motivations to migrate would be for family reunification (18.6 percent), because of discrimination based on their sexual identity (2.4 percent), insecurity (1.7 percent), problems with the gangs (“maras”) or threats (1.2 percent), and violence (0.5 percent). 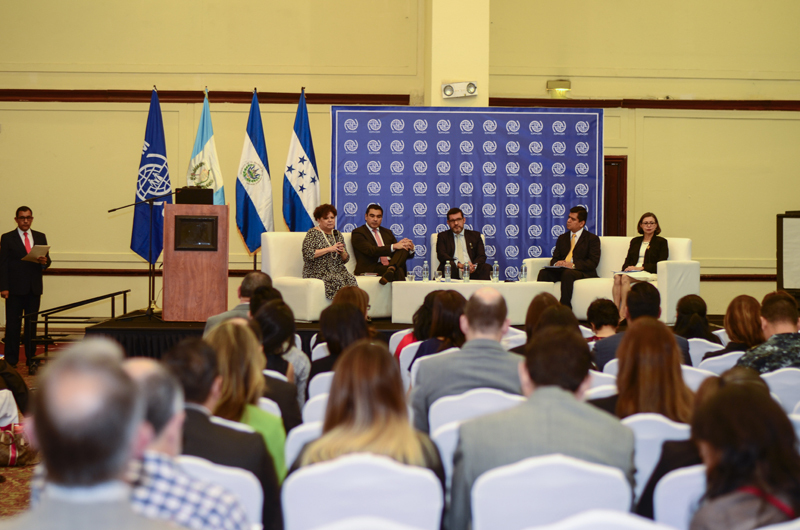 The presentation of the study was chaired by the IOM’s Chief of Mission in El Salvador, Guatemala and Honduras, Jorge Peraza Breedy, and the Director of the Inter-American Dialogue’s Migration, Remittances and Development Program, Manuel Orozco. Officials from the Ministry of Foreign Affairs, the Bank of Guatemala and the National Institute of Statistics also attended the event. “The study included the municipalities where we have identified higher international migration, where we collected reliable data. We are grateful for the openness we encountered both among families and the local and national authorities,” Peraza said. The Survey on International Migration of Guatemalans and Remittances 2016 is part of the project Initiative of Management of Information on Human Mobility for the North Triangle of Central America (NTMI, as in Spanish), financed by the United States Agency for International Development (USAID). NTMI program, implemented by IOM, aims to strengthen the capacities to gather, analyze and share information on human mobility to support humanitarian action and protection of vulnerable populations in El Salvador, Guatemala and Honduras. IOM recognized in the event the progress that Guatemala has made in guaranteeing migrant’s human rights and, at the same time, reaffirmed its commitment to support all actions that help this population, both at national and local levels.